Thinking of upgrading? If you want to access or update your payment information, this section will explore the different types of accounts, payment plans, and billing methods. Nirvana offers 2 types of accounts. Learn more about these benefits on the Nirvana Pro page. 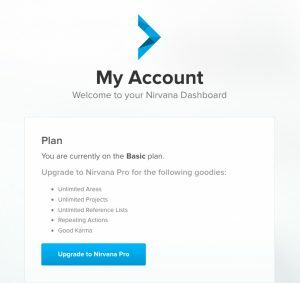 At the top of the page, under the heading Plan, click Upgrade to Nirvana Pro. Under Billing cycle, choose whether you’d like the monthly or yearly plan. Under Method, choose either Credit Card or PayPal. Click Upgrade Now and enjoy! It may take a few seconds for your credit card company to give the approval after you hit submit, but after that Nirvana will update your account instantaneously. You’ll quickly receive a confirmation email and have access to the Pro features. If your country uses zip/postal codes, you’ll need to enter one. If not, it’s OK! Just leave it blank or add an x. We accept Visa, MasterCard and PayPal. We can only accept payments online, so we will be unable to accept a P.O., to invoice you, or to take an order over the phone. Nirvana charges in USD only. If your credit card is in another currency, your credit card company will handle the exchange to your local currency automatically. The converted amount will appear on your credit card statement. We may offer other currencies in the future, but not at this time. If a payment method fails, the system will try 2 more times, each 5 days apart, before the subscription is downgraded. You will be notified by email and have the opportunity to update your payment information. If you choose our limited time offer of lifetime access, your account will be upgraded to Nirvana Pro forever with a one-time payment. If you upgrade to a monthly or yearly subscription, Nirvana is a pay-as-you-go service. You’ll pay for the upcoming month or year, depending on which billing cycle you choose. You can cancel your subscription anytime. If you’re on the monthly or yearly subscription, you can change your selected billing cycle at any point. However, if you move to a yearly or monthly subscription, the switch will only become effective at the end of the current billing period. If you switch to lifetime access, the change will take place immediately. At the top of the page, under the heading Plan, click on the desired option. On the next page, confirm your choice. If you’ve moved to a yearly or monthly subscription, this message will state the date the new billing cycle will take effect. Until that time, you will be able to cancel the change by returning to your plan options in the dashboard. If you’ve moved to a lifetime plan, you’ll get a couple of emails letting you know that your plan has been changed. Start with the free plan to see if you like Nirvana. Upgrade to a paid plan on a monthly cycle to see if you enjoy the Pro features. If you want stay on the Pro plan and save some money, switch to an annual plan. As general rule, we don’t provide refunds. You can cancel your subscription at any time, but we do not offer prorated refunds for the remainder of your subscription term. Good to know: To avoid being charged for the next billing cycle, you should cancel at least 24 hours before your next billing cycle begins. At the top of your the page, under Plan, click ​View Billing Activity & Account Info​. On this page, you’ll see your billing information as well as a list of your invoice(s). Click on any invoice to download it in PDF format. Access your account information in the Nirvana dashboard. At the top of the page, under the heading Plan, click Update Billing Info. Update your credit card information as needed. If you wish to change the associated PayPal account, switch from paying with a credit card to PayPal — or vice versa — you’ll need to create a new billing agreement. To do this, downgrade, wait until the agreement expires, then upgrade with the new billing method. If you cancel your Pro subscription, you will still enjoy access to Pro features until the billing agreement expires (at the end of the billing cycle). After that, the areas and projects already exceeding the basic limit will remain. However, you will be unable to add any additional areas or projects beyond the free limit. Go to your Nirvana Dashboard. At the top of the page, under the heading Plan, click Downgrade. Confirm this on the next page. At the bottom of the next page, click Delete My Account. On the next page, enter your password and confirm that you want to delete all of your account information. Something not behaving as expected? Find a solution.